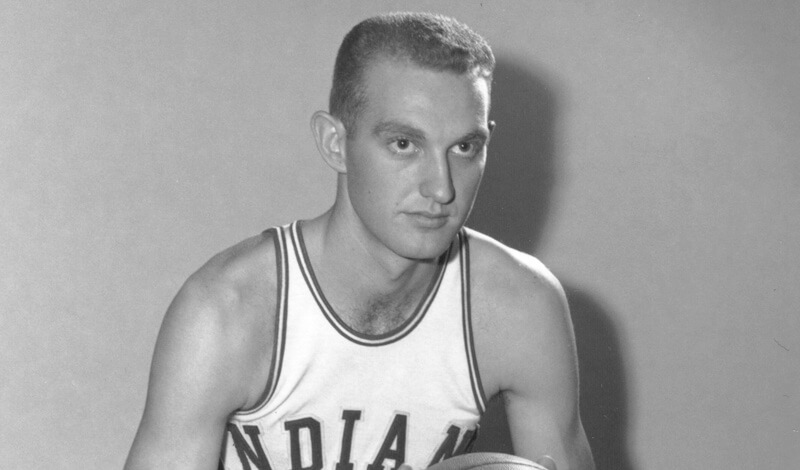 Archie Dees, who won two Big Ten MVPs at Indiana, passed away early Monday morning at age 80. Dees led Indiana to Big Ten titles in 1957 and 1958 and is one of just three players ever to win back-to-back Big Ten MVPs. A member of the IU athletics Hall of Fame, Dees played for Indiana from 1955 to 1958. Dees played for the Hoosiers from 1955-58 and led IU to Big Ten titles in 1957 and 1958. He became the first player in conference history to earn back-to-back- Big Ten MVP honors those seasons, a distinction he shares with Ohio State’s Jerry Lucas and fellow Hoosier Scott May. He also earned All-American honors as a junior and as a senior. In 1957, Dees was selected as the Big Ten MVP after receiving almost as many votes as all other candidates combined. Dees earned the award after putting up 356 points (25.4 avg.) and running away with the conference scoring title. He ranked as the country’s most proficient free throw shooter for his size, sinking 176-of-209 attempts for an 84.2 percentage, 10th-best in the nation. His 106-of-125 in the Big Ten for an 84.8 percentage was tops in the league. He set IU records for a 22-game season in field goals (187), field goal attempts (440) and climbed to third place in career points (933 in two years) behind Don Schlundt (2,192) and Bob Leonard (1,098). His 14.4 rebounds per contest, along with his 25.0 points, made Dees one of the most feared competitors in the nation. In 1958, Dees led the team in scoring, rebounding and field goal percentage. His overall average of 25.5 points per game is the fourth-best season average in school history. His average of 14.4 rebounds per game tied his average in 1957 for fifth place in school history. He finished his career ranked in the school’s top 10 in rebounds (4th with 914), field goal attempts (10th with 1,252), free throw attempts (9th with 522) and free throw percentage (9th with a percentage of .828). Dees was inducted into the IU Athletics Hall of Fame in 1983 and was selected as a member of the Indiana University All-Century team in 2001. Dees was the second pick in the 1958 NBA Draft by the Cincinnati Royals and also played with the Detroit Pistons, Chicago Packers and St. Louis Hawks of the NBA. He also played one season for the Cleveland Pipers of the American Basketball League. A native of Ethel, Mississippi, Dees was a prep phenom at Mt. Carmel (Illinois) High School, where he scored 2,337 points during his career. That mark was later topped by current IU women’s basketball player Tyra Buss who developed a strong bond with Dees during her career at IU and at Mt. Carmel. He remained as a resident of Bloomington and was honored by local government when February 22, 2007 was declared Archie Dees Day. Sad to hear about the passing of Archie Dees. He taught a lot of us what it meant to be a Indiana Basketball Player. Great Hoosier. RIP to the great Archie Dees. He will be missed. RIP Archie Dees. Hoosier great that always had a kind word for everyone. That’s how you become a “blue blood” basketball program. A very long list of great players. God bless you Archie Dees. This is very sad news fellow Hoosiers. It hurts to lose a leader like this man. Capable of stacking up against the most talented in the game today without a doubt. A versatile 6’8″ athletic forward that could run, rebound and score with the best. A legend in candy stripes. He would have fit in perfectly on this year’s team of unselfish, tough men. He was active with the program and lived right here in Bloomington. He loved the game and our community enough to pass on his knowledge, respect and love to all of those who followed in his footsteps. RIP Archie Dees, the epitome of a Hoosier. Thanks #34. I am slowly recovering from the season ending and then this. He was one of the first Hoosiers before my time that I had read about. You can never have too many guys like Archie around, anywhere, ever. I am starting to look forward to next season now that college hoops are over and done for the year. We have a lot to look forward to, especially if TW and TB return. I have a feeling that it could still go either way at this point, and I am looking forward to knowing what we will have for a roster next year. Losing Archie, or any Hoosier for that matter (thinking about Keith Smart), is much tougher than a few guys going on to better things in the pros. They can always come back to Indiana, while Archie will always live on as a memory in our hearts.